One of the necessities which may help the child grow is a baby jumper. There is nothing more adorable than the sound of your baby’s laughter as he bounces up and down in his baby jumper. It’s amazing just how much baby’s love the feeling of moving their bodies. 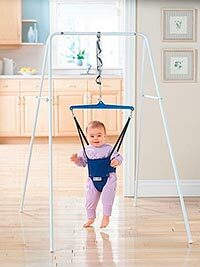 A baby jumper assists the child to bounce and jump around the house or at the veranda. However, many parents don’t have enough details on how to pick the best jumpers. With so many different baby jumpers available how can you choose the right one? Read on to learn everything you need to know about baby jumpers. A baby jumper is a fun activity that allows your baby to use his still developing leg muscles. Baby jumpers are essentially a seat attached to an elastic strap. Your baby sits in the seat and uses his toes to push off the ground. 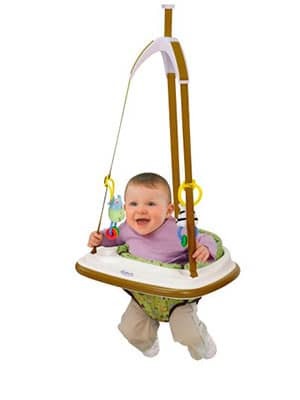 Baby jumpers rely on this up and down movement to keep your baby delighted. Many parents agree that an active baby sleeps better at night and use a baby jumper as a solution to get rid of their baby’s excess energy. A pooped baby is a sleepy baby. Whatever the name, the product is the same, allowing your baby to bounce up and down repeatedly. Most parents follow the rule that if your baby can support his head without help then he is old enough for a baby jumper. The obvious exception to this rule comes when manufacturers put a minimum age weight or height limit on their baby jumper. It is a myth that baby jumpers help develop your your baby’s leg muscles and motor coordination. Many experts actually suggest that baby jumpers delay your baby from walking and only recommend 20 minutes of baby jumper use per day. As always there are two sides to the story. Many mothers report that their baby bounced with joy each day and learned to walk independently without any problems whatsoever. Ultimately it comes down to your decision as to whether a jumper is appropriate for your little one. What is the difference between Jumpers, bouncers and swings? 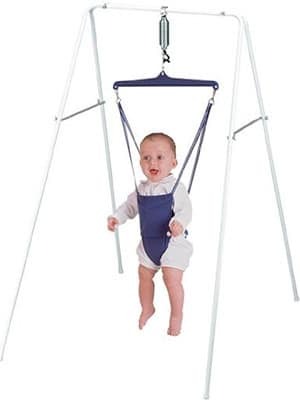 Baby swings – Swing back and forth without the need of your baby to move. 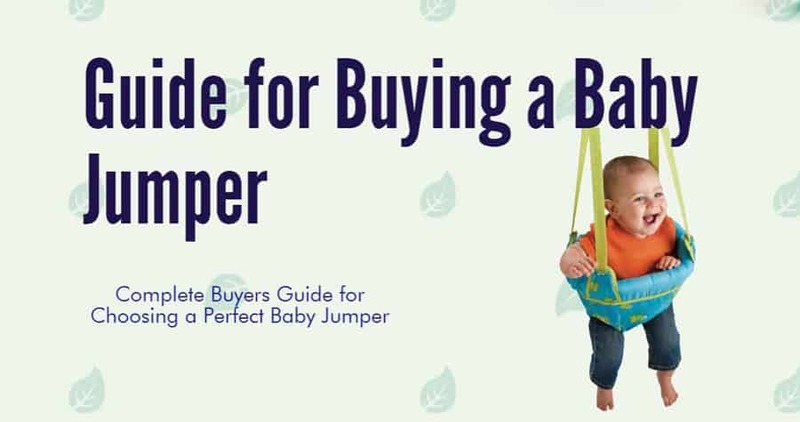 Before we begin, lets take a look at the different types of baby jumpers available. A stationary jumper will consist of a seat, an elastic cord and a frame. Stationary jumpers provide no additional entertainment to your baby other than bouncing. 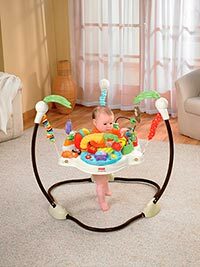 Activity jumpers consist of a seat, an elastic cord and frame as well as a tray filled with a variety of toys. While the toys will vary from jumper to jumper their purpose is the same; To entertain your baby when he eventually gets tired from bouncing. Often referred to as door jumpers, doorway jumpers are made up of a seat suspended from straps that attach to a bungie like cable. On the other end of the elastic cable is a clamp that attaches to your door frame. Doorway jumpers can only be used on door frames. There are a number of different characteristics you will need to take into consideration when shopping for the perfect baby jumper. Baby jumpers have a recommended weight limit that will vary from model to model. Be sure to to choose a jumper suitable to your baby’s weight. Failure to adhere to these weight limits may result in the baby jumper breaking and injuring your baby. Whatever the type of baby jumper, it is vital that you steer clear of seats that are supported by a single elastic strap. A single strap will see the jumper swing left or right which can result in injury. 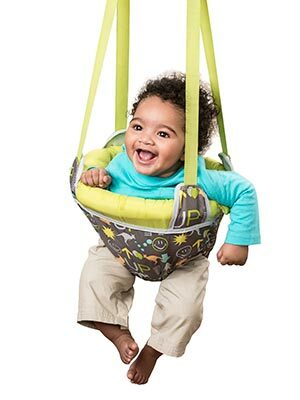 Two or more elastic straps will help keep your baby in place while he bounces up and down. Some baby jumpers will allow you to adjust their height. Adjustable baby jumpers will keep your baby comfortable as he continues to grow. A jumper is not a baby item that is continuously used. You will need somewhere to keep the baby jumper when it is not in use. If you are short on on space in your house then look for a jumper that can be disassembled into smaller pieces for easy storage. 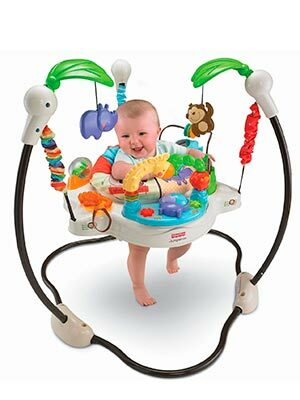 Activity jumpers come complete with a number of different toys to keep your baby entertained. Some are electronic with sounds and flashing lights while others are different textures or make noise as they move. When it comes to choosing the perfect activity jumper for your baby it is a good idea to closely examine baby’s current playing habits. Your baby may love toys that rattle or may even prefer toys that are soft to touch. Choosing a jumper that has toys that your baby already enjoys playing well ensure that your baby does not lose interest. While many people will tell you that baby jumpers are unsafe, the fact remains that they are still legally sold and many parents swear by them. Please adhere to the following points to maximize your baby’s safety when using a baby jumper. Keep the floor clear of sharp or pointy objects that your baby can jump on. Don’t use a jumper near stairs, pools or other hazardous areas. Don’t attach toys with strings to the jumper as these are a strangulation hazard. Stop using your jumper once your baby exceeds the weight and height limit. Don’t leave the room when your baby is jumping. Always place the jumper on a flat, level surface. Remove your baby from the jumper when moving it around. Most of the safety concerns come down to common sense. Many of the kids I have cared for over the years have used various types of baby jumpers without incident. Below I will briefly review the top stationary baby jumpers and take a look at what makes them so great. If you are familiar with baby jumpers then you may have noticed that the Baby Einstein Activity Jumper does not make an appearance on the list below. 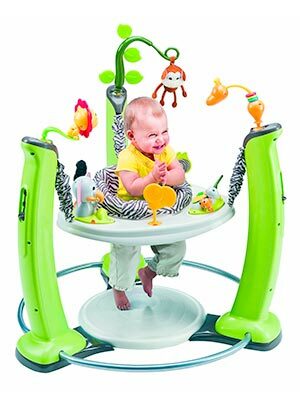 The Baby Einstein activity jumper is one of the most recognized and talked about baby jumper on the market, While it isn’t a bad baby jumper, it is in no way a great one. One of the most expensive baby jumpers available. Requires partial disassembly for storage. While there is a lot to love about the Baby Einstein Jumper, there are much better choices available. So with that out of the way lets look at the best stationary jumpers around. There are two variations of this jungle jumper from fisher price, here is the other one, and both are equally awesome. This is the jumper my kids used and am happy to report that it lasted through some rough play provided by both of my children. I would definitely recommend it to others. A sturdy steel frame construction that folds up for easy storage supports the best baby jumper that money can buy. There is an abundance of toys to touch, push and pull. When your baby gets tired from bouncing there are many fun toys to play with. The springs provide the jumper with just the right amount of bounce and the jumper itself can adjust to one of three positions to accommodate your baby’s ever growing legs. If you think that this may be the baby jumper for your little one but would still like more information then check out the instruction manual. Disadvantages: If your baby is short for his or her age then your little one may find it difficult to touch the ground. Our 7 month Grandson loves his jumperoo! Lots to do and learn. Great that he can turn the seat around to reach different parts of it. Nicely occupies him while Grandma’s in the kitchen. Very sturdily built! Available in 4 different styles (beach, zoo, jungle and bee), this baby jumper has an unusual feature not found on the majority of other baby bouncers, a jumping pad. The jumping pad will allow your baby to use the jumper anywhere in your house, even on cold, hard tiles. With 58 play activities your baby will have plenty to do long after he has tired of bouncing. Some of these toys are removable so that your baby can play with them outside of the bouncer, say, in the stroller or on car trips. Disadvantages: Can be difficult for babies to turn the seat around on their own. A jumper without all the bells and whistles. If your baby is easily overstimulated then this is the baby jumper for you. A supportive frame with non slip feet provides all the bounce of a door jumper without the risk of the clamp slipping. 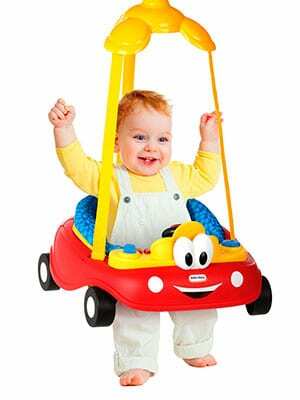 Without toys to focus on your baby will spend the whole time in the jumper bouncing up and down. Perfect for if you have an active baby and are looking for a way to tire him out. Disadvantages: Can be difficult to position and remove your baby from there jumper seat. My granddaughter loves this (and so do her parents). She burns off her excess energy while having fun, and she sleeps extremely well at night. The main advantage of door jumpers over stationary jumpers is their price. Simple doorway jumpers are a fraction of the cost. Just keep in mind that there are a number of safety concerns unique to door jumpers. These are outlined below this list. Easy for baby to enter and exit. If you have your heart set on a door jumper then look no further. Graco’s offering does almost everything right and is a favorite among many parents. Mark free door clamp: Does not leave marks on molding. Built in toy tray: Your baby can play with his favorite toys while bouncing. Hidden safety cord: A safety cord in addition to a study spring. Bonus toys: Removable soft toys that clip directly to the jumper. Another reason why this jumper has secured the top spot on the list is the ease with which you can get your baby in and out of the jumper. The non-twist straps are held apart by the plastic dome which makes the whole process super easy. Such a great jumper! All three of my kids have loved it! I always recommend this one and buy for gifts. Length is able to be shortened, as some have concerns about that. My kids have never smashed their fingers with it either- or if they did they never made a peep about it. A must-have in my opinion! Watch your baby’s face light up when presented with his own car to drive. Babies love to imitate activities that they see their parents perform and driving is definitely one of them. The Cozy Coupe baby jumper uses a steering wheel and sounds to recreate the ultimate driving experience. The steering wheel and dashboard is removable, allowing your baby to continue playing even when out of the baby jumper. The baby jumper seat itself is easy to clean. Just in case you have any nasty diaper leaks! Gave as a shower gift and it was loved. Everyone at the shower admired it and talked about what a great gift it was. One of the cheapest baby jumpers around. Despite it’s low price, the Evenflo jumper is a strong contestant for the title of best door jumper. With seven different color and material styles available, you will have no trouble finding a jumper to suit your baby. A framed seat completely encloses your baby providing a snug yet comfortable bouncing experience. Even with the framed design, the jumper is still very easy to clean. This is a great short time play activity for my 8 month old baby. She loves to jump and has fun when her older siblings play with her while she’s in it. It’s portable from room to room and fun to watch her jump and laugh. As mentioned earlier, door jumpers bring with them extra safety concerns. While these are mostly avoidable it is still worth keeping them at the back of your mind. Your door frame is in no way shape or form a baby friendly object. In fact, it quite the opposite. Hard, wooden and angular. You don’t want any part of your baby coming into contact with the molding with force. The problem is, the baby jumper actually encourages this. The appeal of baby jumpers is that they help support your baby during his pre walking phase, giving him the stage to try out his legs. During this stage your baby is extremely uncoordinated. Your baby could potentially be propelled into the doorway during a vigorous jumping session.While some doorway jumpers have a rubber tray that circles the baby, these are better at protecting your doors molding than your baby who can still extend his arms or head past the barrier. Over zealous back and forth swinging. Many doorway jumpers have been recalled CPSC due to the clamp failing to work as intended. I would hate to have been the Mother who found that out the hard way. A door jumper will require the use of the molding on a door way. This means to walk through to the next room you will either need take your baby out of the jumper or carefully squeeze past your baby which can be inconvenient. If you have a large dog then you will have to be particularly careful when using a door jumper. Rather than squeeze past, your dog is more likely to take a more direct route and run through your baby, sending him head first into the moulding or collapsing the door jumper completely. I hope you have enjoyed reading my detailed baby jumper guide as much as I enjoyed writing it. Do you use a jumper for your baby? Let me know about your experience below.